I can't find a whole lot on this album, aside from the handful of blogs (both music news and download) that make a slight mention to it, but the Swamp Sessions are being compared as the European version (via Colour Haze) of The Desert Sessions. Although I haven't listened to much of The Desert Sessions (I really need too), the Swamp Sessions seem to follow the same line of desert rock, mixed with psychedelia. Six tracks come to almost one hour and twenty minutes of music (you can't get much more in an album), with the longest three tracks coming in at over thirty, twenty and ten minutes in length (respectively). A couple of weeks ago I had a conversation with Reg from this amazing blog about the difference in the generational understanding of stoner rock/metal. Where I don't have much patience with the 'traditional' stoner sounds of Kyuss, Yawning Man, or Sleep, I instead love the more 'modern' sounding stoner acts like Clutch, (new) Monster Magnet, and Ogre. Reg's review of Black Rainbows is what brought this up, and after thinking about it I have to agree with him. While I don't dislike the older acts (either in age or sound), it isn't my favorite style. Apparently I am a child of the new generation. That being said, to me this album is all that is wrong with the desert/stoner rock of yesteryear. It is full of self perpetuating psychedelic stoner rock, which if you love that trippy feel, then you will probably love it. I feel that because I don't readily partake in the act of smoking pot, I don't get to properly enjoy albums such as this one. The songs here fall onto the sword that plagues many artists that attempt 20+ minutes of epic music; some of the segments are really good and groovy, while other sections become boring and tedious. There is no blend or balance and because of this, the album falls short of an epic stoner masterpiece. Each song has it's strong point, but it's muddled within several parts of experimental/avant-garde work strewn throughout, along with spoken word/soundbite parts. Styles and rhythms change randomly, with vocalists coming and leaving, all while a tripped out guitar solo plays. I wouldn't call it bad music, just not something I could listen through again. 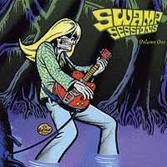 I only found the Swamp Sessions by accident, and honestly it would have been ok with me if I had missed this one. It wasn't bad really, just not my style. They are for someone who likes is different style (or drug) then me; they are good for a trippy experience into your subconscious and that is all. Listen at your own risk. I have to agree with the overall sentiment of the review. I love the Colour Haze and had high hopes for this, but it's just not heavy enough for me. If they had headed a little more down the Earthless/Egocentrics way, I would have preferred it. A slight lack of direction is a good summary really, a slight lack of heavyness is my opinion.